Sadly, a large proportion of electronics recyclers are really just exporters. When you haul your old TV down to your municipal recycling event, thinking you are doing the right, environmentally responsible thing, you might actually be handing it over to a company which will simply load it up onto a container and ship it to a developing nation. See below for examples of fake recyclers who’ve been caught. Why do they fake recycle? Recyclers can make more money by exporting than they can by actually responsibly recycling. This is particularly true for recyclers who are collecting televisions, because it costs money to propertly recycle old televisions. But they can get paid for exporting them to buyers in developing countries who will remove the metals for resale (but who won’t pay to protect workers/communities from the toxics). How do you spot a fake recycling event? Follow the money. It’s a very complicated process to determine whether a recycler is exporting e-waste. You can’t just go by what they say, especially because many will use confusing “greenwashing” terms that sound good, but they are still exporting. Who is paying? The best thing to do is to figure out who is paying for the recycling cost. If it’s free to you to recycle, then who is paying? A manufacturer? The State? Local governmen? A retailer or other event sponsor? If you are not paying, and there is no clear sponsor paying the costs of recycling, then beware of this event. TV’s recycling for free? A big tipoff is the collection of TVs for free. If your collection event accepts televisions, do consumers have to pay to recycle TVs? If this is free or for only a small fee ($10 or less) and there is no entity paying the overall recycling costs for this event (see above) then you can expect these products to be exported. See the Top 10 ways fake recyclers try to trick you. March 24, 213. The CEO of Discount Computers, Inc. was sentenced for trafficking in counterfeit goods and environmental crimes. Among other things, he put fake manufacturer labels on over 100,000 used products to get around import controls in Egypt. See story. Dec 22, 2012. A federal court in Colorado the executives of Executive Recycling of multiple counts of mail and wire fraud, obstruction and environmental crimes related to illegally disposing electronic waste and smuggling. Read more. A “recycler” in Pittsburgh duped local charities in Pittsburgh, PA into hosting recycling events to collect e-waste. Despite his promises to recycle them locally, he loaded them onto shipping containers and sent them to developing countries. Read MORE. Fake recycling in Washington and Texas. Read the EPA’s press release about fake recyclers from Washington and Texas exporting CRTs to Hong Kong. Fake Recycling in New Jersey. August 17, 2009: EPA fines Supreme Asset Management and Recovery, of Lakewood, NJ, $199,900. The EPA says that Supreme exported non-working monitors to Hong Kong. Read EPA press release. Supreme was the subject of an expose by Business Week in 2008. 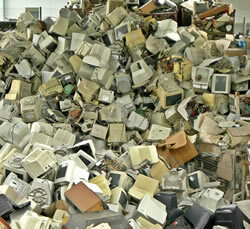 There are many companies in the U.S. who not to export e-waste. These companies (called e-Stewards) go through a review process administered by the Basel Action Network (BAN). They are not yet in every state, but if there is an e-Steward near you, it’s a good option for your recycling. Find an e-Steward in your state.